BLESS A FRIEND! What an appropriate gift for that true friend in your life! 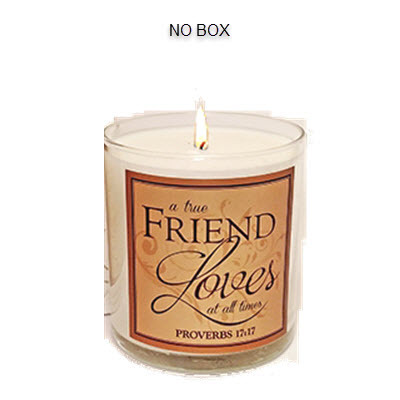 This scripture adorned glass container candle bears the most profound statement of friendship from Prov. 17:17..."A True Friend Loves at all times". And because of the sweetness and dearness of its message, we are offering this candle in two fragrances: Pomegranate and Red Currant. Hand-poured in Abba's facility in our eco-friendly soy blend wax, it has an approx. burn time: 26-30 hours and is 8.7 oz by volume. Container can be used with votives or tealights for continued delight.